In the Bay Area, we often have an Indian summer. It descends each year around this time. And each year, I always wonder why it’s heating up as we ease into September. Just when all the fall clothes pop up in store windows, when the morning light begins to change, and when you feel like you should be making soup–it’s damn hot. And with the heat comes my kitchen lethargy. Rather than cooking, I find myself putting things together instead: salads with tomatoes and squash from the garden, sandwiches with cold cuts and lots of mayo and crisp lettuce, simple pastas with olives and shaved Parmesan, my infamous rustic Mexican pizzas (if you’re lucky, more on that later). So in the summer, I like to make this pesto and keep it in the fridge to have readily available when cooking sounds as enticing as changing a flat tire. Now before we get to the recipe, you may be asking yourself, ‘wait a second. I thought Megan lived in San Francisco where it’s rarely above 75.’ Well, I’ve lied to you. Probably not a good tactic so early on in our relationship. I actually live right outside the city, about 8 eight miles North, in Marin County. I live on a wide street with big leafy oaks in a very large house with a pool, two back yards, a circular driveway, lemon trees, and a box garden. It’s not mine. Now don’t worry: I’m not about to tell you more lies or describe the deviant ways in which I squat in rich people’s homes. The truth is that I’ve actually been living in my mom’s house, taking care of the dogs and the garden while she’s been away doing her graduate studies in Burlington,Vermont. She may be the only woman in her late 50’s that I’ve ever met who up and moves across the country, gets her own apartment in the college district overlooking Lake Champlain, decks it out in beautiful shades of reds and yellows…and gets to work. Like it’s nothing. I’m so proud of her. And so happy that I got to stay in the house for the last few years of my twenties. But change is on the horizon: my mom’s done with her coursework and coming back for good in two weeks. I guess it’s time to have that huge house party I’ve been meaning to have for the last few years (just kidding, mom). I say I live in San Francisco for a few reasons, the obvious one being it’s just easier for people who aren’t familiar with our massive state. The main one being that I really do live there in a sense. I’ve never felt a connection to Marin, where mothers cruise down the suburban streets (or the outdoor malls) in double-wide strollers, where luxury stores abound, where it’s actually impossible to get something to eat after 9 p.m. Trust me when I tell you the place shuts down. So I drive into the city numerous times a week and, emotionally, feel much more at home and at ease. There’s something about the fog, the dramatic hills, the particular neighborhoods, the food. I love having brunch in Hayes Valley, running along the Marina with my new running friends, getting dumplings out in the Richmond, strong coffee and used books in the Mission, or having a picnic in Shakespeare’s Garden. It’s just more me. Now that I’ve confessed my white lie, let’s move on to the pesto, aptly named for the physical place I lay my head. For now. 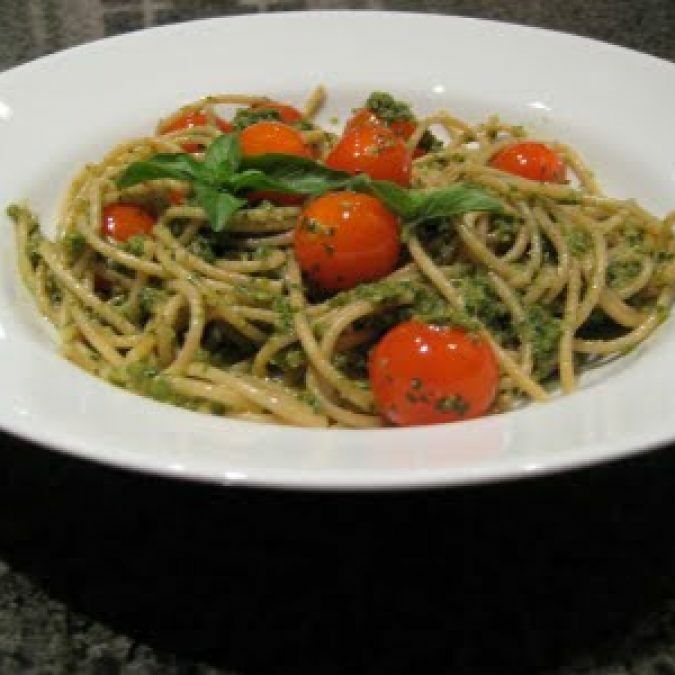 This pesto is a nice alternative to more traditional pestos made with pine nuts. It’s full of really good fat from the Omega 3 oils. It tastes complex and summery with a serious hit of garlic, fragrant basil, and a nice blend of grated cheeses. The trick is to use high quality olive oil instead of a common table oil. You will taste the difference. Once you gather the ingredients, this is a simple, quick pesto: 10 minutes max. Will keep in the refrigerator for up to 5 days. 2 cups basil, rinsed and dried. Place basil, olive oil, garlic, and walnuts in food processor. Blend until combined, about 30 seconds. Add the Parmesan and salt and blend a few seconds more, until neatly folded in. If using with pasta, after boiling and draining the noodles, add 1 tablespoon of pasta water to the pesto and stir thoroughly. This loosens it up a bit. If using as a spread instead, you may need to add a little oil according to your preference (some like thicker pesto). Regardless, it tastes like an August afternoon. Hmmm - I am sure I commented on this but now can't remember! Something along the lines of "I love the idea of using walnuts in pesto!" Also, I just made my own garlic scape and almond pesto which I will post soon. It was delicious! when are you inviting me over for dinner? i can not believe i was harboring a "foodista" in 316 all that time! Such a lovely pasta dish! I love that you used walnuts in the pesto! Yes! I love pesto. I use pine nuts in mine. I find that this freezes really well - which is critical in New england! I'm batting 1000 with your recipes Megan! Great pesto - got a good bottle of olive oil and some good cheeses. I hadn't made pesto in years, probably because it wasn't this good. Threw some tiger prawns in with the pasta for the last minute of cooking. They went really well with the pesto. Made the three coconut porridge for breakfast. It was yummy; looking forward to the leftovers for a quicker out the door morning. I think my husband doesn't know what's got into me. He's been doing most of the cooking for the last couple of years. Thanks for recipes that are relatively healthy and delicious too. Don't sweat the photos on these early posts; it's fun to see the evolution.